Donald Trump’s second State of the Union speech reportedly went over well with most Americans, who told pollsters overnight they approved of what he had to say. I was one of those Americans. The pollsters didn’t call me, but I’ll offer this unsolicited view: The president did hit a few good notes and I applaud him for hitting them. Criminal justice reform is a big deal and I am glad to hear him insist on reforming federal laws that punish non-violent criminals too harshly. I was delighted that Gladys Johnson, whose life sentence in prison for a first-time drug conviction that Trump commuted, was there to receive bipartisan applause. Infrastructure repair also is a big deal. We need to fix our crumbling roads, bridges and airports. How we pay for it is another matter, given that it’s going to cost well north of $1 trillion. That’s about it in terms of supporting the president’s policies. Trump called for an end to “partisan investigations.” Well, actually, I don’t consider special counsel Robert Mueller’s search for the truth behind allegations of “collusion” with Russians who attacked our electoral system to be a partisan exercise. It’s an important one. Yes, the president is right to assert that we need unity at home if we’re going to assume our role as world leader. I’ll just offer this notion: Let the special counsel finish his work, allow him to reveal to the public what he found, let us discuss the findings openly and then we can decide what steps — if any — to take before we move on. 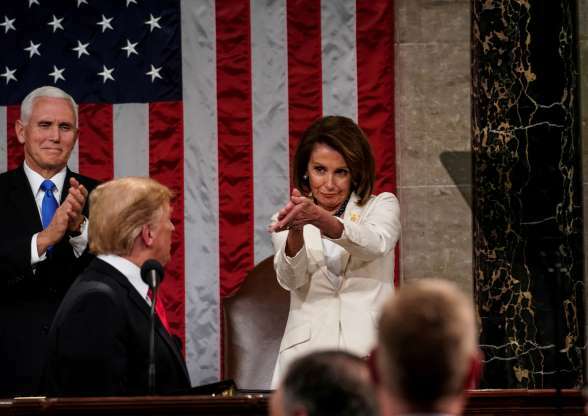 I won’t get into the body language chatter that has erupted on social media, such as the strange hand-clap given by Speaker Nancy Pelosi or the sitting on hands by congressional Democrats who now comprise a majority of the House membership. I simply find the president’s pleas to be utterly lacking in sincerity. He says the right words, but I cannot get past the belief that he doesn’t actually believe what he says. Therefore, how can he expect the rest of us to buy into whatever message he seeks to deliver. Previous PostTrump sought ‘unity’; he fell shortNext PostHereford Brand gets new life! How about that? 1. President Trump is not a polished professional speaker, as are most politicians, so his presentation is going to be rough. Like most politicians, he can’t lie to his audience and make it come out as the truth. I too agree that the Criminal Justice System needs reform and our infrastructure is in need of repair. I’m not totally against toll roads and paying a toll to travel a well maintained road. I’m used to it in Dallas and sometime I choose to take The Tollway or 121. I’ll use toll roads in Oklahoma and Kansas if I need to get somewhere quickly. If that is what it takes to improve and maintain roads and bridges…. so be it. I think our Congress needs to become less partisan. Politics is the art of compromise. Seen any compromise lately? 2. Hillary Clinton lost out to Trump. Was there anything amiss about that election……. probably. Both sides performed their shady shenanigans to sew up the election. This time, the Republicans were better at it. If Hillary had won, would we be investigating improprieties…..probably not. The Democrats lost…. accept it and get on with the business of government. Remember……Every Politician is bought and paid for. 3. Border security IS a problem. Illegals ARE coming here. That is a fact. I don’t mind immigration, but come here legally. I don’t mind our government helping legal immigrants get established. I do want them to become citizens before they can vote. I don’t like the illegal immigrants coming in. Not only are they taking our resources, but they are hurting the legals who want to make a difference in their lives. We have limited resources to help immigrants, let’s use those resources on the legals. Build the wall…. it works two ways. When those Yankees get tired of 50 below winters, they may want to move south. Mexico will be glad there’s a wall then. And finally the news media need to become bi-partisan. If the news media wants to make a difference, they will print the “Actual” truth. If something is right….. point it out. If something needs changed….. point it out. Not every thing the Democrats propose is good. Not every thing the Republicans propose is bad. Since neither party can work together for the common good, the news media needs to point this out and get both parties working together for the common good. Democracy is not all bad. Socialism is not all good.